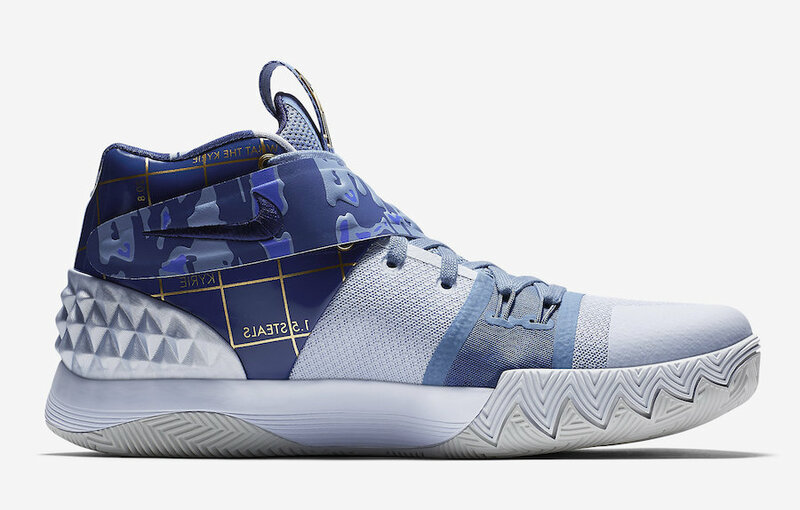 Looks like Nike will be releasing two versions of the Nike What The Kyrie S1 Hybrid, a silhouette that combines Kyrie Irving’s three signature shoes. Unlike the first pair that comes in Brown, Khaki, Blue, Orange, and Black color tones. This version features a blend of Blue, Gold, and White hues. The original shoe is called the Nike Kyrie S1 Hybrid, but this pair another “What The Kyrie” version which is written on the lateral side. A U.S. date has yet to be announced, but this Nike Kyrie S1 Hybrid “What The” will first debut in Japan on December 9th. The retail price tag is set at $130 USD. UPDATE: Nike releases official photos of the second “What The” Kyrie S1 Hybrid.